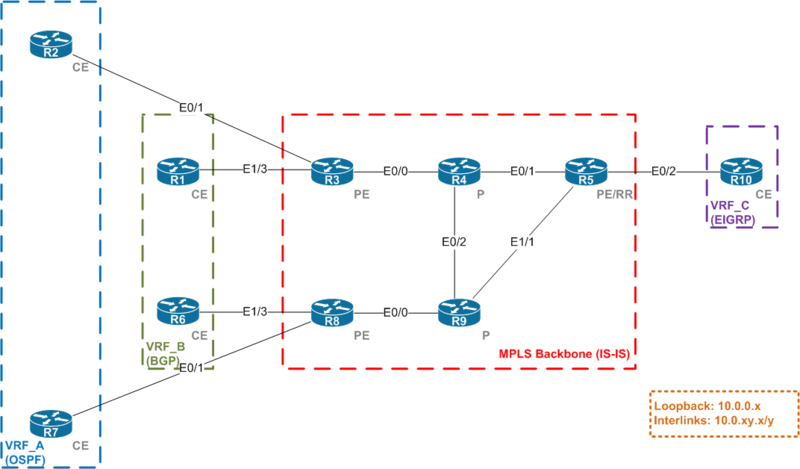 MPLS VPN route is combination of route distinguisher (RD) and actual prefix. RD is an unique identifier used to distinguish the same prefix from different customer. We define it at PE router for particular VRF. Prefix combined with RD and actual IPv6 prefix is called vpnv4 prefix and is carried by MP-BGP. If the RD is 65000:1 and IPv4 prefix is 10.0.0.1/32 then vpnv4 prefix is 65000:1:1.0.0.1/32. BGP extended community support is required to carry vpvn4 prefixes and labels. It’s enabled by default for vpnv4 address-family but it’s usually good to also carry standard community. To carry vpnv4 prefixes we configure iBGP in core network. It either require full mesh connections between routers or route reflectors deployment. We go with second option making R5 as a route-reflector. Let’s look at R5 configuration. To simplify configuration we use peer-groups. We also use loopback0 interfaces as source of updates (loopbacks are advertised in IS-IS so unless all links are down there should be connectivity). All neighbors are deactivated under address-family ipv4 because we are not going to use them to forward standard IPv4 prefixes. We activate them under address-family vpnv4 only. We can use no bgp default ipv4-unicast command under bgp process to make router not activate neighbor under address-family ipv4 by default. Also for this peer-group we are going to send both standard and extended communities. We also define every member of this group as a route reflector client. Now all other routers have only to establish session with RR to receive all vpnv4 prefixes. I’m not clearly enough about this. can you explain more about that ? if we not use them to forward standart ipv4,so whats we use ?